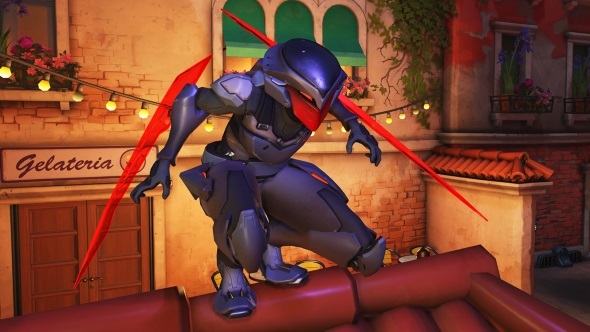 Overwatch Retribution is the exciting new PvE event for Blizzard’s ever-popular FPS, Overwatch. In anticipation of this new mode, we had the chance to interview assistant game director Aaron Keller and principal software engineer Adrian Finol, during which we discussed the influences of Left 4 Dead, the design features of the new Rialto map, why there have been so many support heroes added to the game, and why they decided to scrap Hanzo’s divisive Scatter Arrow ability. Want to know what Jeff Kaplan has to say? 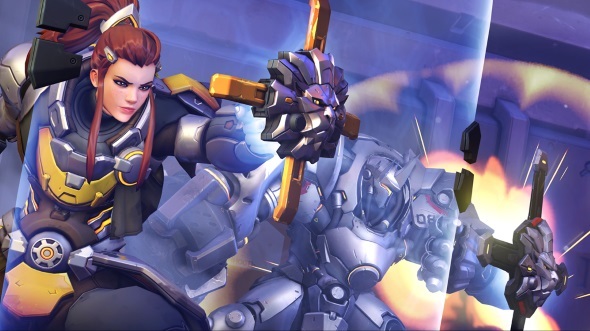 Check out our second Overwatch Retribution Q&A. PCGN: What did you learn from Uprising and what advancements did you make for Retribution? Adrian Finol: We wanted to look at ways of replaying the game. We felt like once you’d played Uprising ten times you were done with it, you’d seen everything it had to offer. For Retribution we took that to heart and we wanted you to be able to play as long as you want. Hopefully, you’ll play it until the event is over, we think we’ve made good progress there. We changed how the stories unfold and how they’re delivered to you. There are no longer points where you stop and wait for the story to unfold. Everything is told via dialogue as you move through the streets of Venice. We also wanted to add more key moments, which our special units bring. The specials are a really good opportunity for players to stop and deal with the situation. Uprising was one tone: you go from hack point to hack point. We wanted to change how that is displayed. Aaron Keller: It’s cool too because with the specials we have little cinematic intros for each of them. It’s something we wanted to do in Uprising but we just didn’t really have the time. At that time they were really labour intensive to get in, so we were able to work on that earlier this year because we knew that we wanted them. Another thing that’s really cool is fighting the Talon ecology. We knew we wanted to have another group of enemies to fight against. 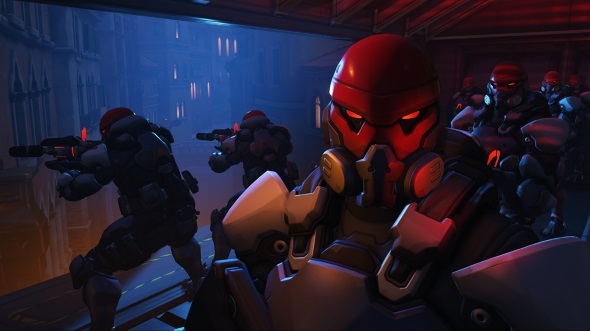 I think the Omnics are really cool, but Talon are kind of like the arch enemy of Overwatch, so just having them in there kinda lends this sinister, badass feel to the mission. Adrian Finol: It wasn’t very clear. Everytime you asked someone why you’re hacking this console they were like ‘I dunno, because I have to hack the console’, and they had no idea what they were doing story-wise. We actually try to minimise any UI object element on the HUD because we want it to feel natural. You should know what to do and where to go at all times. The characters themselves are delivering all those lines and objectives: ‘Let’s get out of here’ or ‘Go there’. So it’s pretty clean, and players in feedback say they actually appreciate the fact that they always knew what to do without having some heavy handed piece of UI telling them. What advancements have been made in your PvE enemy AI? Aaron Keller: In Uprising, enemies would mostly spawn right in front of you or around the corner and rush you. It did feel like waves a lot. One of the things we wanted to do for Retribution was to have different ways of introducing enemy units into the scene. We wanted to have a lot more really cool and exciting moments for players to experience, so this time we have Talon dropships that will rush into the scene, and enemy units will jump out two or three at a time. Guys will come in on skips that hover over the water, they’ll crash in through a glass ceiling and ambush you there, or kick doors in and ambush you. There’s a lot of different ways enemies can get into the scene. Obviously, the specials take it up a notch too. In a lot of the encounters, a heavy assault might just drop in from the air and smash into the ground and then start taking you team on. These are really exciting moments and I think we levelled that side up as well. Adrian Finol: We also think the AI is there in service of the player. It is there to put on a show and make it fun. We don’t think it’s fun if the AI is so smart that you never land a hit. If you’re Genji and everytime you pull your deflect a super super smart AI will be like ‘OK, I won’t shoot this guy because he has deflect and he’ll kill me’. But we feel like you want to feel the fantasy of being that ninja. So when you pull that deflect out we’re going to make sure some guy decides to shoot you at that right time. That’s our approach to AI, we just want to put on a show for the player. The specials do it very well. The assassin makes you feel like you’re being hunted, and the sniper divides the space in two and makes you think about how to see through that space. We even added things to our trooper and enforcer units so they know to stay close to each other. They form little packs with a leader, and they’ll die and roll out of the way. Aaron Keller: We did a lot of things to the units to have them react to the heroes too. The Genji reflect is a great example. But a lot of the heroes – not just in Story Mode, but even in the rest of the Overwatch roster – there’s a lot of special code that the AI uses to react to all of their abilities. At the end of the day we just want players to feel powerful. It’s exciting because I typically play support and tank in Overwatch, but with this event it’s mostly DPS heroes so I’ve been playing a lot of McCree in it. I feel like I’m actually getting better at those heroes so that now I can go home and play McCree in free-for-all deathmatch. I haven’t won, but I’ll actually place top four because of all the practice I’m getting. Was Left 4 Dead an influence on Retribution’s special units? Adrian Finol: Left 4 Dead, of course, is a huge inspiration. It’s a four-player PvE game and we learnt a ton from that game. The assassin plays very sneaky, she’s slippery. It makes you think about how she’s blinking around the walls, trying to pin someone down. So it really forces players to work together to solve that problem. Think about it like puzzle pieces. When an assassin spawns you have to work out how to solve it. Similar with the heavy: when the heavy assault spawns you’re like ‘Oh boy, we thought we were safe and now we have to deal with this massive wall’. So they all serve the purpose of puzzle pieces in this massive encounter. Aaron Keller: It’s really cool because players are always trying to figure out how to deal with one of the specials, but when you encounter two of them at the same time it springs a different kind of crazy dynamic. Adrian Finol: It also helps a lot our designers with designing encounters. The more specials we have, the more pieces we have to play with and the more combinations of things we can do. What challenges came with designing a map that was both PvE and PvP? Aaron Keller: We had a lot of ideas on how hard it would be ahead of time. We thought that a PvE experience would never work in our PvP maps. But you’ll notice that there are two rather large, completely unique spaces for the PvE mission, although I don’t think they actually play any better than the rest of the map. The PvP version of the map actually ends up playing really well for the mission, and I think part of it was just smart unit design and smart AI. The other part of it is just our heroes are so fun to play with, and if you create a space that they play well in, they typically play well whether it’s against another player or if it’s against AI. I think one of the reasons is that we have a specific vision for what Overwatch PvE combat is. It’s actually a little similar to our PvP combat: it’s very fast paced, it takes a whole team working together in strategic way in order to be successful, and it always needs a quick read of the space that you’re in in order to engage the enemy effectively. That’s one of the major reasons that our PvP map actually works really well for our PvE combat. What evolution does Rialto bring to the Payload map type? Aaron Keller: Each time we make a map we’d like to bring something unique to the table and have a different experience to it. And so the map designer, Gabe Adams, built a lot of things in here that either we don’t have in other maps or we don’t have in the same ratio. There’s a lot of really difficult corners for the attackers to get around in this map. In a lot of our maps we’ll have chokepoints where the attacking team will have to funnel through an area in order to attack an objective, and with a payload map you always need to stay with the objective. Sometimes a right-angle corner is the toughest thing to get around. 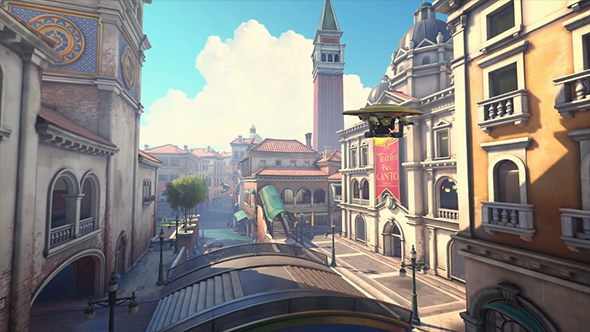 There’s this one corner in this map – it’s actually two sequentially, it’s a big U you have to travel around, before this really cool view of one of the canals in Venice. We always call it Devil’s Corner because it’s so hard to actually push the payload right around this section. There’s all these flanking routes through the buildings there in order to enable the offense and the defence to circle around and get an advantage. There are also a few areas where environmental hazards are really close to the payload path. We typically don’t do that, but this being Venice you need to have some water and you need to have canals in order to fulfil the fantasy. Right in the middle of the map there’s this big canal that cuts through the space and the payload has to travel across a bridge to cross it. It’s a great opportunity for characters like Lucio and Pharah to bop people into the water. One of the really cool things here is that there are gondolas travelling across the canal, so if you do get knocked off you’ll have the chance of landing on one of those and getting lucky. Then you’re able to climb out and push on. Where is the current weak point in Overwatch’s roster roles? Aaron Keller: You’ve seen that we’ve recently added our latest hero, Brigitte. She’s a support hero, and the hero we released before that was Moira and she’s a support as well. That was something we felt like we really needed to add to. I think that if you have more support characters in the lineup, there’s gonna be more heroes for all players to be able to relate to or find a playstyle that they enjoy. The two of them bring something completely unique to the support side of Overwatch, something we were missing. We have seen players’ response to that, and you get a lot more people playing those heroes. I think it’s also brought down some of the toxicity where people [were upset] and feel like ‘Oh, I have to play support’. We had no options available to them [within the support role], and so I think that was something that we did need to work on. I think that the support role is in a much better place now because we did. The defense role has the fewest heroes. Does it need some extra attention? Aaron Keller: It gets a little tricky because some of our defense heroes are very good playing offense with. You look at a character like Junkrat and he’s labelled under the defensive role, but he’s played on both sides just as frequently. So it gets really tricky when we start talking about the defensive role and whether or not it has enough heroes to it. It’s not so black and white, and you need to lump both of those offense and defence heroes together. Would you remove role labels from heroes? Adrian Finol: [laughs] That would be amazing! Aaron Keller: There’s always a possibility for something like that. We’re always going to want some way of categorizing heroes, even if it’s just to make it easier to find them in the lineup. But there’s a possibility something like that could happen. What does the future look like for Brigitte? Aaron Keller: I haven’t looked at the stats for her in a little while so I can’t say exactly whether or not we think she’s overpowered or underpowered at this point. I think that we’ve gotten a lot of great feedback from all over the spectrum on Brigitte, from really low level players up to GM and even Overwatch League players. Everyone sees a lot of potential with the character and I think we’ve got a lot of response where they feel like she’s a very well designed character. It’s interesting because from Overwatch League teams we’ve seen some of them say they really want to play her and add her to the lineup, and some of them say they won’t run her at all, which is sort of the perfect place to have heroes. At the very top level of play, depending on the playstyle of the particular group, they’re viable, and then at the very lowest level of play they’re viable also. I think we’re really happy with where she is now, but we’ll have to keep an eye on her and see if there are any changes we have to make. Adrian Finol: We have to be careful about being too reactionary about things. We like to watch things settle. As we’ve shown in the past, we’re willing to change heroes for the betterment of the game, but we’re not always right and we’ll go back and change things. So we’re just gonna wait and see on her. Hanzo has been a divisive character since launch. Why is now the right time to rework him? 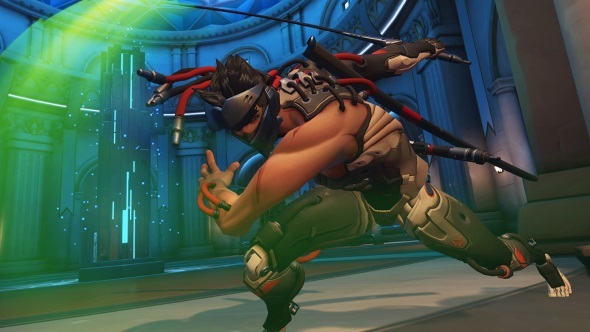 Aaron Keller: It’s funny, I think that there’s always been a reaction against Hanzo – specifically the Scatter Arrow – and the timing of it is hard to really pinpoint. Some of it is how much time we’ve got, and some of it are if the things we’ve been trying are working. 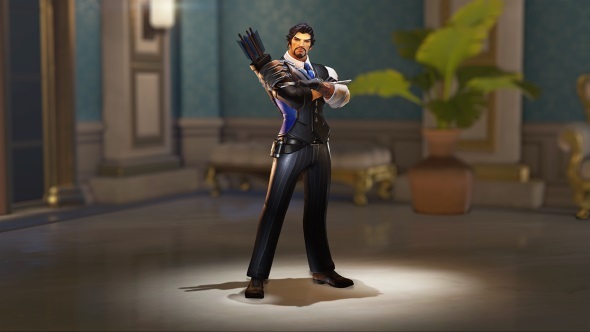 Hanzo’s been a character we’ve had our eye on for a long time, and we’ve actually tried a lot of different things on him internally, but most of it hasn’t worked out for the character. I think Geoff Goodman has really nailed an experience that’s still true to the original character and also feels very powerful, but also feels very fair to fight against at the same time. So that’s what happened, we just came up with something that we thought was great. Is Scatter Arrow the core issue with Hanzo? Aaron Keller: Yeah it’s funny because you mention it’s been a very divisive ability since launch. I think it was divisive long before launch! What other game modes would you like to introduce to Overwatch? Aaron Keller: A lot of the different game modes that come out in the events are based on desires to see something new in Overwatch. With Capture the Flag for Lunar New Year it was just something we always wanted to see in Overwatch, and you can see each year that sometimes the marquee game mode changes a little bit. In 2016, the winter event had Mei’s Snowball Fight, and we included it with the most recent one but we had the Yeti Hunt, too, so there’s definitely other things that we’d like to try. We’ll probably always, for the foreseeable future, stick to events to introduce those game modes. There’s definitely things we’d like to see in the game. Nothing I can really talk about, but there will be new stuff. Overwatch Retribution is currently live, and runs until April 30. Want more? Check out our Overwatch hub page for more news from Blizzard’s hero shooter.